One of the challenges facing Democrats in the upcoming tax “reform” fight, is that the stakes of tax policy can feel abstract. With Obamacare repeal, progressives had little trouble illustrating the grave consequences of the GOP’s reactionary agenda: Millions of people would lose their insurance; nonaffluent cancer patients would be priced out of chemotherapy; and severely ill babies would hit their “lifetime limits.” By contrast, it’s hard to tell a truly harrowing story about the repeal of the state and local tax deduction. It’s possible that Republicans will make Democrats’ task a bit easier by attaching draconian spending cuts to their giveaway to the rich. But at least for the moment, the GOP seems reluctant to give to the wealthy and take from the poor simultaneously. After all, they already tried that with Obamacare repeal, and it made the cruelty of their agenda too vivid for comfort — eventually, the reverse–Robin Hood accusations overwhelmed Senate Republicans, and they removed capital-gains tax cuts from their health-care bill. This time around, Senate Republicans plan to finance their giant, regressive tax cuts by adding at least $1.5 trillion to the deficit over the next decade. We know this, because the caucus has put its intention in writing: Last week, Mitch McConnell & Co. unveiled a budget resolution that gave the party explicit permission to add that hefty sum to the national debt. One way for Democrats to respond to this move would be to decry the GOP’s hypocritical betrayal of fiscal responsibility. Democrats could scaremonger about America’s $20.2 trillion debt (while neglecting to mention the nation’s offsetting assets), and then hope that voters are so horrified by the thought of that number rising to $21.7 trillion, they mobilize in opposition to the Republican bill. Alternatively, the party could accept the GOP’s premise: They could establish a bipartisan consensus around the idea that America has $1.5 trillion to burn — and then, the party could ask the American people whether they’d like to spend this free lunch on a tax-cut scheme that delivers 80 percent of its benefits to the top one percent, or on programs that address the broader public’s material needs. Which is to say: They could present voters with the same stark tradeoffs that killed Obamacare repeal. In my humble opinion, they should pick door number two. 1) Lift 3.2 million children out of poverty; make four-year public college tuition-free; and guarantee every worker 12 weeks of annual paid family and medical leave at 66 percent of their monthly wages. According to the Century Foundation, you could give every American child under 6 an annual allowance of $2,500 — thereby lifting 3.2 million children out of poverty — for $17.7 billion a year (so, let’s say $277 billion over a decade, what with procreation). Bernie Sanders’s plan for making public colleges and universities tuition free has an estimated price tag of $80 billion or so (let’s say $900 billion over a decade, what with inflation), while his plan for expanding American workers’ family and medical leave benefits carries an estimated price tag of $320 billion over ten years. You do the math. 2) Give 4.4 million unemployed Americans a $15-an-hour public job. In 2000, 79 percent of prime-age, non-college-educated Americans were employed. But opportunities for such workers have eroded over the past 17 years — and now, our economy would need to add 4.4 million of them to the job rolls just to get that demographic’s employment rate back to its turn-of-the-century level. There are not nearly enough home care workers to aid the aged and disabled. Many working families with children under the age of 5 need access to affordable child care. Schools need teachers’ aides, and cities need EMTs … [S]ome individuals may be hired into paying public jobs in which their primary duty will be to complete intensive, full-time training for high-growth, in-demand occupations. These “public apprenticeships” could include rotations with public and private entities to gain on-the-ground experience and lead to guaranteed private-sector employment upon successful completion of training. According to CAP’s back-of-the-envelope math, giving full-time, $15-an-hour jobs to 4.4 million Americans would cost about $158 billion this year. Over a decade, this might end up closer to $1.6 trillion than $1.5 — but that’s before you consider the off-setting benefits to economic growth! 3) Double the Earned Income Tax Credit for working-class families with kids; quintuple it for childless workers. Democratic congressman Ro Khanna has introduced a bill that would double the EITC for low-income families with two kids, raising it to a maximum of $10,800. For childless low-income workers, Khanna’s bill would bring the EITC up from $510 to $3,000. In practice, this would mean that a two-child household earning $18,000 a year would see its after-tax income rise to over $28,000. Khanna’s bill would cost $1.4 trillion over the next ten years. 4) Provide universal public day care to all who want it, and build a national high-speed rail system. According to the Economic Policy Institute, a program guaranteeing every American child access to a high-quality day care or prekindergarten would cost roughly $90 billion in its first year of operation. Costs would go down once the new child-care infrastructure was put together, but let’s say it would cost $900 billion to maintain for a decade. According to the libertarian Cato Institute, building a national high-speed rail system would cost $500 billion. 5) End homelessness in the United States; pass Trump’s original infrastructure plan; then give every single American about 90 bucks. The Department of Housing and Urban Development believes it could end homelessness with an additional $20 billion a year in funding. 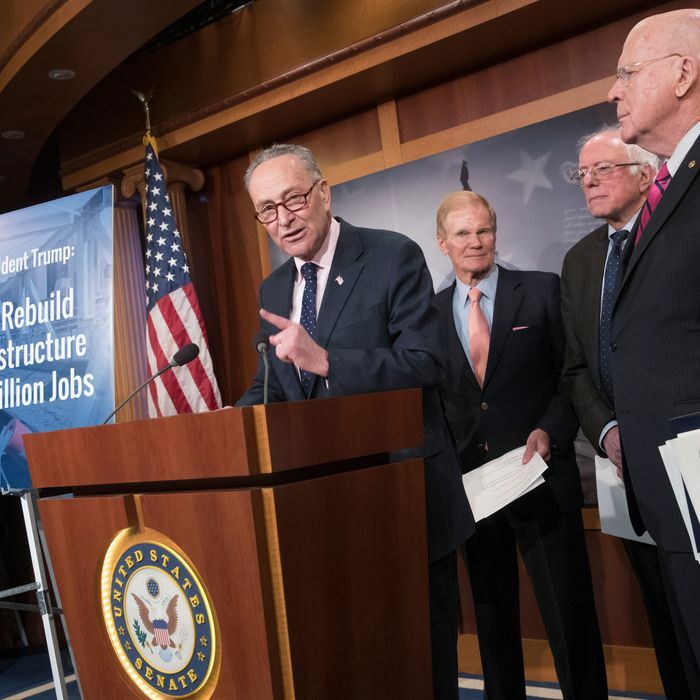 On the campaign trail, Donald Trump vowed to spend $1 trillion on rebuilding America’s infrastructure, a proposal he likened to the public-works projects pursued during the New Deal. With the $300 billion left over after we end homelessness and make America great again, we could give every American about $90 bucks.